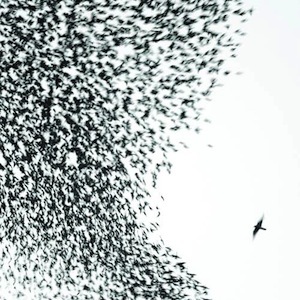 Swole Ear’s Wilco Week continues today with a review of 2007’s Sky Blue Sky. Good news, for all of my (10, we’re up to 10 now) readers who were wondering—Jeff Tweedy made it back in time for the recording of his band’s fifth record! I know. I’m really relieved too. I don’t think I could have dealt with another A Ghost Is Born. Unfortunately for you, you’ll have to put up with reading one of my boring, positive reviews, as opposed to my ever–exciting, ever–biting album trashers. Oh well, you’ll manage. It almost appears that Wilco is having some sort of identity crisis on this record. For example, Sky Blue Sky is a particularly twangy track, reminiscent of the group’s early stuff, but it’s followed with Side With the Seeds, a particularly “indie” track, with no southern influence about it. Wilco has always done that though—I did point out a similar occurrence on my review of their second record, Being There, earlier this week. I guess Wilco’s bi-polar music stands out more on Sky because I’ve never really noticed a contrast quite like that before. Wilco’s schizophrenia is what I love about them, though. They can do so many different things really well; most of their stuff just doesn’t get boring. Take Hate It Here, for instance. It turns from a piano ballad to a standard rock, and even encompasses a bit of country along the way—all in just around four minutes. There just aren’t many bands that can pull that off.